It's a universal cry when women are frustrated. It's also the universal cry when writers are annoyed. Men are tricky little devils; their thought processes can be very foreign to some of us women. There is a reason for the outstanding success of books like Men are from Mars, Women are from Venus or He Said, She Said. Men think fundamentally different from women. We could talk for hours about the major and minor differences in the way men and women approach different problems or aspects of life, but today's blog is going to center on the difference between the Alpha Male and the sadistic jerk as pertains to romantic fiction. I once attended a writer's workshop were the speaker proposed that men in fiction are actually one dimensional. That they are simple, visual reactors of what is around them. And while I agree to a point--men do react visually--I disagree that men do not have the same depth in personality women do. They do, they just express it differently. As writers, our job is to find out how our characters will express their depths. Some do so quietly through small actions while others do so violently through intense conflict. The typical Alpha Male character is considered to be the strong leader of the group. His reactions can range from the quiet but intense stare to the over the top violent outburst. What all Alpha Males have in common is their steadfast determination to solve the problem at hand. They don't wait for someone else to find a solution, are generally proactive, however, a good one sees the value in the opinions/actions/contributions of those around him. In relation to his romantic life, an Alpha Male determines what he wants and goes after it--oftentimes full force. However, he is not going to force relations, but he'll be persistent. He'll also soften for the woman in his life, differ to her wishes when possible. Not a pushover, he is willing to hear the other opinions. When you are dealing with the Alpha Male and the Alpha Female you develop this mutually respectful, but sometimes vicious, tug of war between them. Two strong personalities vying for dominance. It can be a very exciting interchange to write. A strong Alpha Male is not a sadistic jerk. The sadistic jerk will cause pain for his own amusement--and lose your reader's respect at the same time. A sadistic jerk will stalk your heroine, frighten her, keep her in an uneasy state. Sometimes there is a fine line between what an Alpha will do and a jerk. For instance, an Alpha will never arbitrarily kill someone, even if they try to kill him. He'll do so out of self defense, but always after the killer attacks. None of that makes a good Alpha Male. The classic anti-hero is often meant to be an Alpha Male but unintentionally twisted into a sadistic jerk. We need to be careful of this trap: an anti-hero may skirt the law, be forceful with his minions but he'll never take advantage of his woman. He also will not commit violence for violence's sake. When an Alpha Male commits violence there is always a good reason for it. 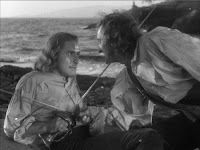 Let's take a favorite movie of mine, Captain Blood. (I just read they're remaking...as a space movie...*shudder* *gasp* the horror!) Peter Blood is the classic alpha hero: he's strong, determined, gathers loyal men to him, fights the bad guys, and wins the day. In the book, there's a scene where Captain Levasseur captures a (I think, going from memory here!) Dutch ship on which his 'love' is traveling. When the captain of that ship tries to protect the woman, Levasseur pushes him away, stabbing him with his sword. Why? Because he was between he and the woman Levasseur wanted. This opened the woman's eyes and she rejected Levasseur. Faced with this interference, Levasseur murdered a man he needn't. The sadistic jerk. Peter Blood, faced with interference from his Arabella's uncle, Colonel Bishop, leaves him alive. Bishop wanted Peter dead for a variety of reasons, the latest because he was a pirate. But Peter left him alive on more than one occasion. Why? Because he knew killing Bishop, even in a battle, would devastate Arabella. Peter Blood is the Alpha Male. Levasseur is the sadistic jerk. Plain and simple.